Finally! 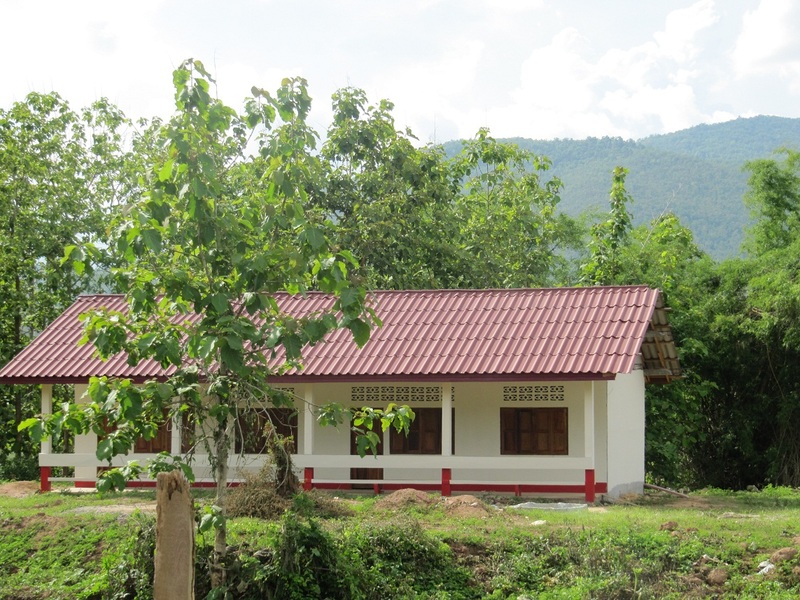 Nong Boakham Secondary School is complete – at least Phase 1 is complete. We were 3/4 of the way through construction and then were told that there were 3 teachers, not 2 as previously stated. Too Late! 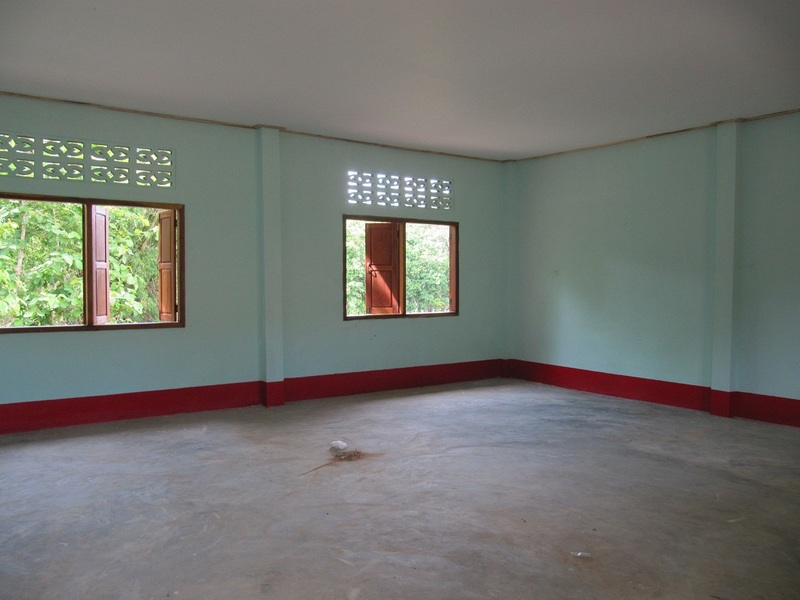 It is not easy to raise $10,000 and that is the cost per room for this school. 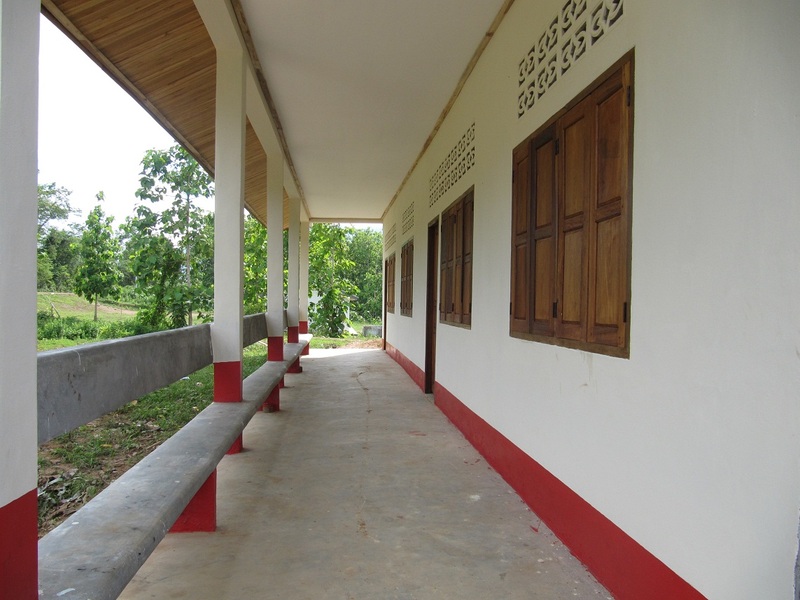 Secondary schools require much larger rooms than the rural villages because this school will support the graduating primary school students from many villages. I am not sure what they plan to do with the 3rd teacher but I have raised only $2,000 towards this and school is supposed to start September 1. I suspect that they will try to use the old school shack until a new room is added on. Any takers on the challenge of raising the other $8000 in a hurry? I have to admit that this school is the nicest we have built to date. The reason you don’t see furniture in the rooms is that school is out for the rainy months of summer and nobody wants to see the furniture stolen. 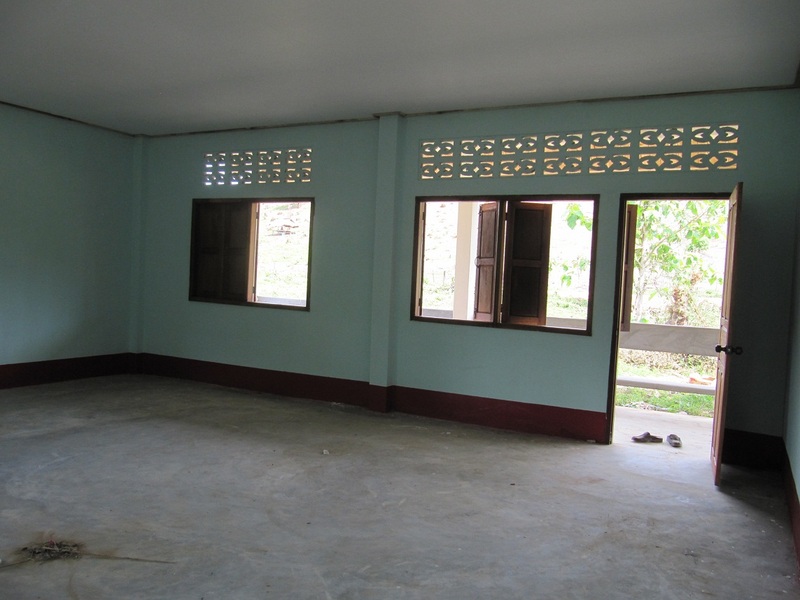 Eventually we will add 4 more rooms, a small library, washrooms and a soccer/futball field. We added outdoor seating and wood fascia, different from the rural villages. Seems bright a cheery with the colours they chose. Since our return from Laos this year, I have been working diligently in strengthening our Board and those abroad. As such I am pleased to present our Directors of the Board. 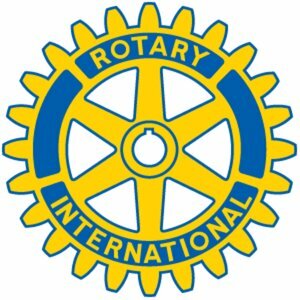 Steve Rutledge – President of AAVIL, Rotarian on the International Committee responsible for Asia at Whitby Sunrise Club, recipient of two Port Hope Civic Awards, the most recent in 2011 for Philanthropy and is a recipient of the Paul Harris Award. Steve was co-owner of a medium sized computer firm for 22 years. Since then Steve has served on several boards and committees including the municipal Culture Committee, Skatepark Committee, Capitol Theatre Board, Canadian Spinal Research and others. Cleve Pendock – Secretary of AAVIL, President of Pendock Mallorn Ltd., a software company, Secretary of The Rotary Club of Port Hope and treasurer of Northumberland Hills Music Festival. Pendock Mallorn Ltd. is a developer of financial management and accounting software, which he founded in 1988. Prior to that, he was Vice-President of Finance at Black and Macdonald, an international electrical and mechanical contracting firm. Cleve founded ‘Tax Payment Systems’, a bi-monthly newsletter to advise large corporations the most cost-efficient way to pay their taxes. He holds a Bachelor of Commerce degree from Concordia University. Hugh J. Parker, director of AAVIL, serves as chair of the Board of Northumberland Business Development Assistance Corporation, Chair of Port Hope Community Health Centre and Past-President of Community Living – Northumberland West. Hugh is also an active Rotarian and past president of Port Hope Rotary, and Compensation Officer (Arbitrator) for the Port Hope Area Initiative Property Evaluation Program. Hugh was educated at Yale University and the University of Western Ontario. His experience includes 5 years as senior university administrator and 30 years as a lawyer practicing in Port Hope from 1977-1985 followed by 3 years of sole general practice. He provided legal counsel to the Children’s Aid Society of Northumberland from 1978 and was employed full-time by them in 1988 until 2007 when he retired. Mr. Parker is Past President of Port Hope Lions Club, Port Hope and District Hospital and the Ganaraska Probus Club. He also served as a member of the Kinark Child and Family Services provincial Board of Directors and the Port Hope Police Services Board. Douglas Byers, director of AAVIL, is a member and past president of the Rotary Club of Whitby Sunrise. He served as District Governor for District 7070 in 2009-10.Currently he is district trainer and sits on the membership committee,chairs Interact and Earlyact and is a member of the planning committees for the District Conferences for 2012 and 2013. He will chair the Family Council for Hillsdale Terraces a long term care facility in Oshawa. Mr. Byers is a former teacher, principal and administrative officer for the Durham District School Board. He holds a BA in Art History from Carleton University and a MED in Supervision and Administration from Niagara University. He also has a Visual Arts Specialist and Principal’s Qualifications. Linda Goldie, B.A. (Psych), M.S.W., director of AAVIL, Rotarian and Past President of the Northumberland Sunrise Club, sits of the Port Hope United Church Ministry and Personnel Committee, member of Port Hope ACO Garden Tour Committee, Chair of the Kawartha Branch of the Ontario Association of Social Workers, Five Counties Children’s Chair, and Chair of the Board of Cornerstone Family Violence Prevention Centre. Linda has also served on many other Boards, Committees and Children’s Aid Societies including Board of Directors for Northumberland Big Sisters, Children’s Case Co-ordination of Northumberland County and the Hastings, Prince Edward and Northumberland Branch of the Victorian Order of Nurses, Advisory Committee of Kinark Child and Family Services, Advisory Committee for the Northumberland Emergency Response Program for Youth and many others. Barry Mount CLU, director of AAVIL, serves as President and is a founding partner of Hardiman, Mount and Associates, established in 1984. He is a charter member of the Rotary Club of Whitby Sunrise and has served as Director, Treasurer, Vice-President and President, in addition to serving on various committees. Barry has also serviced as Committee Chair, Director, President and Chairman of the Whitby Chamber of Commerce, a director and chairman of Lakeridge Health and served as a member of the Mayor’s Task Force for physician recruitment in Whitby. As a strong supporter of the community, Mr. Mount has served in various community activities including soccer coach for 13 years, 10 years as a Scout leader and 3 years as vice chair, and board member of the Henry Street High School Business Council. Barry is past Chairman of the Chamber of Commerce Group Insurance Plan Agents Advisory Committee and current member of RWAM’s Insurance Administrators Inc. agents advisory council. He also served as a Director for the Whitby Hydro Energy Corporation for two, three year terms ending January 2012. Dianne Pendock, director of AAVIL holds an associate diploma in Performance (A.R.C.T.) from the Royal conservatory of Music, a Licentiate in Piano Performance (L.T.C.L.) from Trinity College, London England, and Licentiate in Performance and Pedagogy (L.P.P.) from the Glen Gould Professional School R.C.M. An experienced performer, accompanist and teacher for all levels of piano study, Dianne has served for several years with the R.C.M. College of Examiners, is an active member of the Ontario Registered Music Teachers Association, serving as president of Scarborough and Peterborough Branches. Dianne is also co-founder and chair of the Northumberland Music Festival. Abroad, I have assigned Mr. Siphan Phanthavong as our head co-ordinator during the absence of a director and Mr. Sayphone Souchan as co-ordinator. Mr. Somnuek Bounsa is my consul. To date, we have provided hygiene training to schools, hospitals and entire villages, resulting in the distribution of 440 of them..and the list continues to grow with the support of our amazing sponsors. On behalf of the villagers, we thank you. Towards the end of our last visit, the cost for my last shipment worked out to be $65 per water filter. As a result, I have had to increase the price to reflect this. However it doesn’t seem to affect the will of our sponsors which is tremendous news. $65 goes a long way to improving the health of the rural villagers. We also updated our brochure to include our charitable status number. As a result, Canadian donors may also receive tax receipts for their generosity. We have discovered that two of the most popular reasons to purchase a water filter system is for Christmas gifts, instead of traditional monetary gifts and for those who wish to honour their loved ones in memoriam….